Akitas are powerful, striking dogs. They come in a variety of colors for the American breeds and a narrower band of accepted colors for the Japanese strain, but all have the characteristic short, double coat of many cold-weather adapted dogs. Akitas are hardy working dogs that typically remain aloof with people they don’t know. Once you adopt one, they quickly acclimate and become affectionate members of the family. They have stout, stocky bones and a rugged appearance. They’re considered very good with children, but require heavy training to view non-threatening strangers without aggression. The breed has a reputation for being dangerous and isn’t for the first time dog owner. However, with proper training and an experienced owner, this breed offers loyalty and intelligence. Akitas burn through a lot of calories because of their sturdy build. They were bred to be hunting, and fighting dogs and their stocky builds give them that look. Food should be nutrient dense to handle their caloric requirements without adding empty calories. Weight can be an issue because they are prone to skeletal problems such as hip and elbow dysplasia. Excess weight puts a lot of pressure on those joints causing pain and difficulty moving. Foods that help Akitas maintain a proper weight are essential. They’re also prone to thyroid issues, so quality ingredients without common fillers are excellent for keeping those symptoms at bay even if the condition is genetic. They do have some instances of skin irritations and food allergies, so it’s even more essential that their food mimics the ancestral diet as much as possible. Akitas are a pretty healthy breed overall aside from a strange immunity to many vaccines and anesthetics. However, even hardy breeds can have a few issues to watch out for. Here are three things you should keep in mind. Stocky work breeds are prone to dysplasia, a condition where the joint doesn’t form correctly and so doesn’t line up exactly right. Without proper care, this can cause pain and mobility issues down the road. It’s primarily an issue with dogs that develop a weight problem because their skeletons aren’t stable enough to support the weight. While you can’t cure the condition, foods that offer supplements for joint health are a good start. Things like glucosamine and chondroitin can help keep the joints supple and in good working condition. Nutrient dense foods can also help your Akita maintain energy without adding a lot of extra calories. These formulas are vital for maintaining a healthy weight. This disease is another inherited one, but having food that doesn’t exacerbate symptoms can complement the treatment plan set by your veterinarian. Many common filler ingredients are thought to have an effect on the thyroid, especially gluten and soy fillers, so high-quality foods may help in the long run with maintaining proper endocrine levels. Your veterinarian will work with you to find the best treatment plan, so be sure to ask what to look for in a food besides dense nutrition and proper, canine thyroid friendly ingredients. You may also need a diet that helps to maintain appropriate weight levels despite your Akita’s condition. Although not common, some Akitas inherit immune disorders that can affect internal health or external areas such as the skin. When this happens, your dog may not be able to fight off disease or may develop rough, inflamed patches on the skin where the body is attacking itself. A diet with dense nutrition and immune support can help aid the immune system and reduce the amount of discomfort your dog feels. Avoid foods with common allergenic fillers that can cause strong immune reactions and opt for foods with whole protein sources and essential fatty acids. Probiotics are good additives as well as antioxidants that support healthy immune functions. For some dogs, limited ingredient formulas may be best. These usually contain seven or fewer ingredients and are designed to aid a dog’s delicate digestive system in obtaining proper nutrition from food and avoid immune responses in the digestive tract. They’re considered a giant breed, so it’s vital that they maintain weight and that puppies grow slowly. Foods should be nutrient dense without a lot of empty calories so that puppies grow at a proper rate. Otherwise, you could damage their bone structure and cause issues down the road. They’ll need roughly 2200 calories per day for an average 100-pound adult. Dogs that are smaller, less active, or with specific health issues may need fewer calories. They do well with moderate fat and protein content, and you should avoid over-supplementation, which can cause dietary imbalances. Look for foods with high-quality proteins from whole sources as the first ingredients. They also need complex carbohydrates from sources that won’t cause a spike in blood sugar, such as sweet potato. Fruits and veggies can offer a lot of antioxidants and vitamins to support immune functions. Essential fatty acids help keep skin issue at bay. A double coat requires a lot of maintenance, but healthy skin can help reduce shedding and keep the coat supple and healthy. Akitas are particularly sensitive to soy, so it’s critical that the food you choose be soy-free, as this may contribute to some of the immune and thyroid disorders Akitas are prone to. Other fillers can cause issues as well because empty calories and food allergies are common causes of skin irritations and digestive problems. Too many fillers, such as corn and gluten, lead to empty calories. Your Akita may eat more to recoup nutrients lost through basic biological processes causing excessive weight gain and huge issues with bones and joints. Poultry by-product meals are also frequent culprits of immune flare-ups especially in dogs sensitive to poultry proteins. Some dogs may be at increased risk of a condition called canine dilated cardiomyopathy (DCM). Dogs fed consistently high levels of potatoes and legumes seemed to be at a higher risk for developing the disease. Although the link isn’t clearly established, you may want to use your best judgment concerning those ingredients. 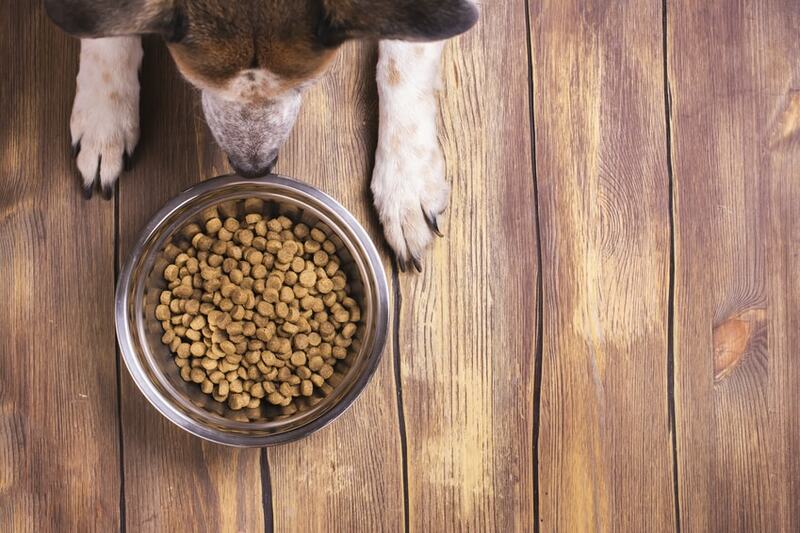 Many budget dog foods and store brands are guilty of loading their foods with fillers and byproducts. Beneful is one of the worst offenders with fillers in nearly all the top ingredient spots plus artificial colors and preservatives. Kibbles n Bits is another well-known brand that uses low-quality ingredients making kibble hard to digest and not very nutrient dense. Ol Roy may be very affordable, but it also is mostly filler with few whole proteins or whole nutrients. Full grown Akitas average 2230 calories per day while puppies (which are frequently around 60 pounds) may need an average of 750. Some breeders and expert Akita owners feed food only once a day with regular fasting to mimic an Akita’s wolf-like tendencies and to give the digestive system a break. If you’re thinking about this route, get the approval of your vet before you start. Puppies: serving sizes will depend a lot on the food and the individual puppy. Puppies change so much so quickly that it’s especially important you consider your vet’s recommendations for growth control and portion sizes. Healthy adults: as many as four cups per day fed twice a day to help avoid bloat. Seniors: Senior dogs should receive the same amount of food as they received when they were younger with a caveat. Veterinarians should monitor weight closely and adjust feeding to account for lower activity levels and any age-related conditions. We’ve put together a list of our favorite dog foods for Akitas. They all provide dense nutritional content for all stages of life and many are large breed specific. Let’s take a look. Our best overall food is a large breed specific formula designed to help keep weight at appropriate levels and support bone and joint health. It uses freeze-dried bits of meat for texture and flavor plus premium kibble to promote overall health and nutrition. It uses deboned chicken as the first ingredient to provide whole, stable proteins. Chicken and turkey meal provides further protein and caloric support. It does contain potatoes but not in the first three ingredients. Whole veggies and fruits give proper nutrients and vitamins for a healthier immune system, and Merrick uses no artificial colors or preservatives. It’s soy, corn, and wheat free as well. Glucosamine and chondroitin provide additional joint support while omega fatty acids from salmon help keep the skin healthy and the coat soft. There is no gluten, so very sensitive dogs should be fine. Merrick is committed to providing dependable, quality nutrition much like what your Akita’s ancestors may have eaten. Recipes are created in Merrick’s organic kitchen, and the company sources only quality ingredients for each recipe. The company is based in Texas and manufactures all products in the United States. This recipe uses deboned beef, lamb, and venison for a complete and varied protein source. It includes essential omega fatty acids to promote coat health and has complex carbohydrates to help maintain energy levels and a healthy weight. Blue’s trademark LifeSource bits provide an excellent source of antioxidants and vitamins. It’s totally grain free, so sensitive Akitas should still be able to digest it well. It uses fruits and veggies primarily to provide nutrient and antioxidant support for a healthier immune system among other things plus probiotics for further digestive and immune support. Blue Buffalo got started with the search for quality food for a dog named Blue. The family began their journey with her and now provide quality foods for dogs with food sensitivities. They have a wide range of size-specific and dietary specific foods to help dogs with better digestion and to stave off the effects of poor immune responses to food. They create all their formulas in their own test kitchen and manufacture in the United States. NomNomNow’s introduction to a raw food diet for your Akita makes feeding raw really simple. The Tasty Turkey fair uses turkey and eggs for complete proteins and calcium with brown rice as a slow release complex carbohydrate that helps stabilize energy levels. Whole fruits and veggies provide excellent doses of vitamins and minerals, which helps with immune support, and fish oil contains essential fatty acids for maintaining skin and coat health. Everything is packaged in easy to use portion sizes, so there’s no confusion about how much to feed each mealtime. Fill out a questionnaire for your dog and receive perfectly portioned meals. Put them in your refrigerator or freezer, and they’re ready to serve when you are. NomNomNow is a veterinarian created raw food system designed to give your pet optimum nutrition in a limited ingredient formula. Everything is created using restaurant grade ingredients and shipped within days of getting made. It’s easy to set up your account and manage things based on your dog’s needs. If you’ve got the extra budget, it’s worth it. It’s especially important for growing Akita puppies to get a dense nutrition food without added fillers because rapid growth and weight gain can severely tax a puppy’s growing skeletal system. Look for foods that are specifically for large breed puppies so that you can maintain a proper growth trajectory. Blue Buffalo’s formula is specially created to help large breed puppies maintain optimum growth and weight. Puppies receive dense nutrition without extra calories and no fillers that could set off weight gain detrimental to their growth trajectory. It’s gluten and grain free and made without corn or soy fillers. Omega fatty acids help protect the skin and encourage a healthy coat. Whole proteins as the first ingredients provide building blocks for strong muscles and a proper growth curve. This formula uses sweet potato to provide complex carbohydrates with plenty of energy. Blue Buffalo’s mission is to provide a raw food alternative to keep dogs healthy and thriving. The company uses premium ingredients for its kibble plus trademark LifeSource bits for extra boosts of nutrients. The company was started in honor of their Airedale terrier, Blue, and continues to support puppies of all breed sizes. Solid Gold’s puppy food isn’t large breed specific, but it is intended to wean a puppy’s delicate digestive system from milk. It contains all essential nutrients from quality ingredients and no fillers. It’s soy, gluten, wheat, corn, and artificial preservatives free. It uses superfoods to support a robust immune system and really controlled but healthy bones. Whole protein beef is the first ingredient along with beef liver plus egg whites and then veggies. It includes DHA for brain health and function and omega fatty acids for better skin and a healthy coat. Portion sizes are easy to control, and it’s soft enough for your puppy’s beginning teeth. Solid Gold has over forty years of expertise providing superfood pet foods to customers to keep pets healthy and thriving. The company was started by a woman in the 1970s out of love for her dog at the time. They offer grain free, allergen-free formulas with whole proteins and plenty of high-grade ingredients. Seniors sometimes lose activity levels due to age or pain, and it’s essential to maintain their weight. It can also be helpful at this time to assess if moving to a limited ingredient food would be best for your Akita’s digestive system and overall weight management. Merrick’s formula isn’t large breed specific, but it has a host of benefits that should keep your Akita healthy throughout its life. It uses deboned chicken as the first ingredient for a lean, whole protein source plus whole veggies and fruits for vitamins and minerals. It’s grain and gluten free plus free of fillers such as soy and corn. It’s a nutrient-dense formula meant to maintain weight while providing plenty of nutritional value. Glucosamine and chondroitin support healthy hips and joints while omega fatty acids help with the skin and coat. L-carnitine promotes healthy digestion and metabolism for further weight control, and all ingredients are locally sourced near Merrick’s Texas base. Merrick is a Texas-based company that takes your dog’s nutrition to heart. They use only premium ingredients for kibble plus no fillers or known food allergens for better digestion and nutrient-dense products. Everything is created in their test kitchen before going out to the public. Blue Buffalo’s large breed specific formula continues to protect your Akita’s bone structure and joint health even through the aging process. It uses deboned chicken for a whole, lean protein source and brown rice for complex carbohydrates. It also features glucosamine and chondroitin for joint health, L-carnitine for digestive support, and essential fatty acids to improve the condition of the skin and coat. It contains no fillers, no soy or corn, and no artificial colors or preservatives. Your Akita’s large stature needs special care throughout its life. Choose food that will support proper growth, weight, and bone health to avoid potential issues down the road. Then, you can enjoy your loyal, cat-like giant for many years. Is your Akita part of the Japanese or American line? Let us know in the comments below.